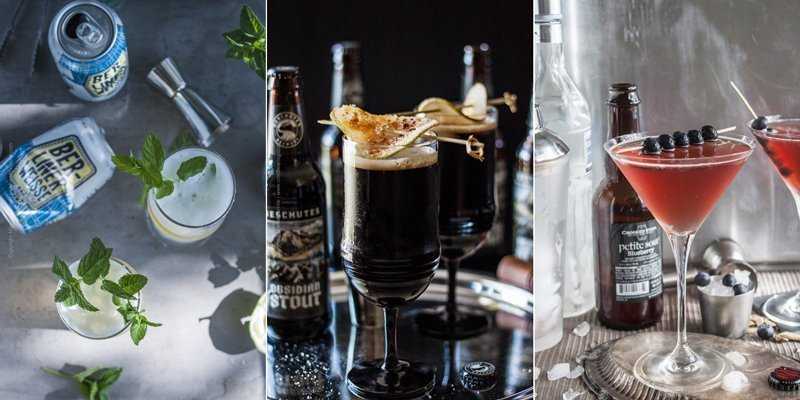 From classic beer cocktails, through beer blends, brunch and light day-drinking options, to innovative libations using the trendiest craft beer styles we have you covered. 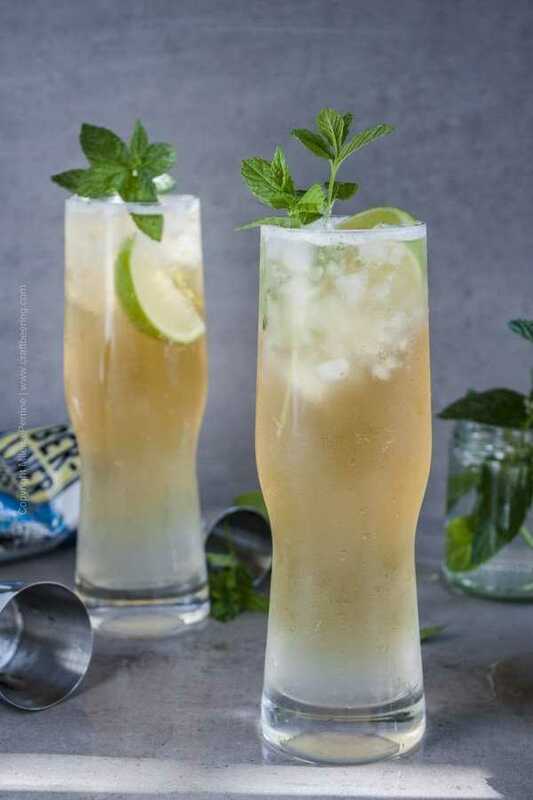 Browse our constantly expanding collection of recipes or read our useful Tips and Ideas on Mixing Beer Cocktails. The rich sensations beer induces as a beverage offer infinite possibilities as far as mixed drinks are concerned. 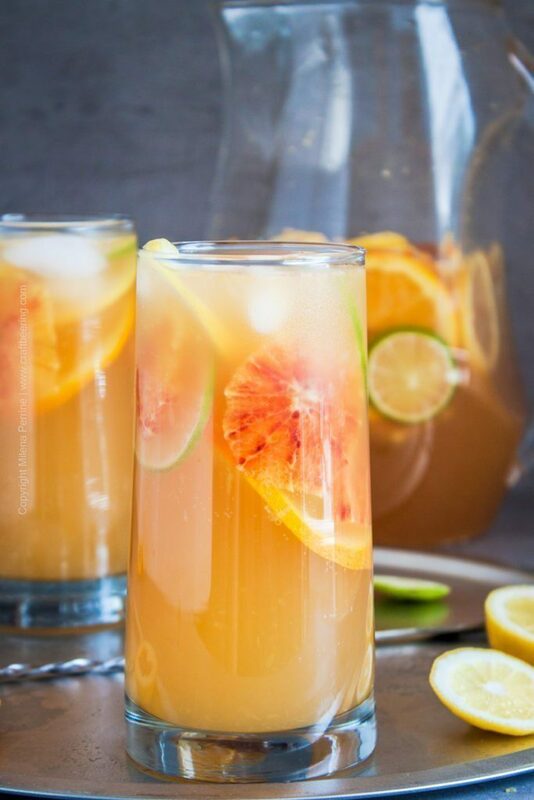 The variety of its aromas, tastes, mouthfeel and alcoholic strengths coupled with its carbonation can enhance many popular cocktails and be used as the basis for other innovative and fun drinks. When considering the flavors of different beer styles and how they can be leveraged in a mixed drink it is important that you keep in mind that flavor is a synthesis of sensory inputs. Visual perception, aroma, mouthfeel and taste combine to give us the experience of flavor. Therefore what comes through as the dominant flavor in a beer can be mostly due to dry hopping and the ensuing aromas. Or it could be the sour taste in result of lacto-bacillus/combination fermentation or a fruitiness present entirely due to the workings of a yeast. When constructing your own beer cocktails consider which aspect of a beer style could play a lead or balancing role. 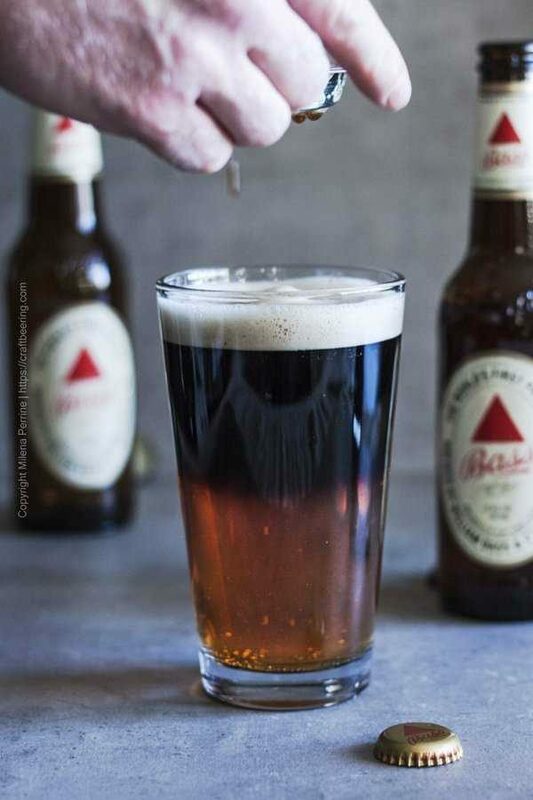 Body – many beers can substantially add to the perception of a smoother, thicker cocktail. Styles with oats or wheat in the grain bill can add a layer of creamy smoothness to drinks. Carbonation – beer’s CO2 is one of its foremost contributions to cocktails. 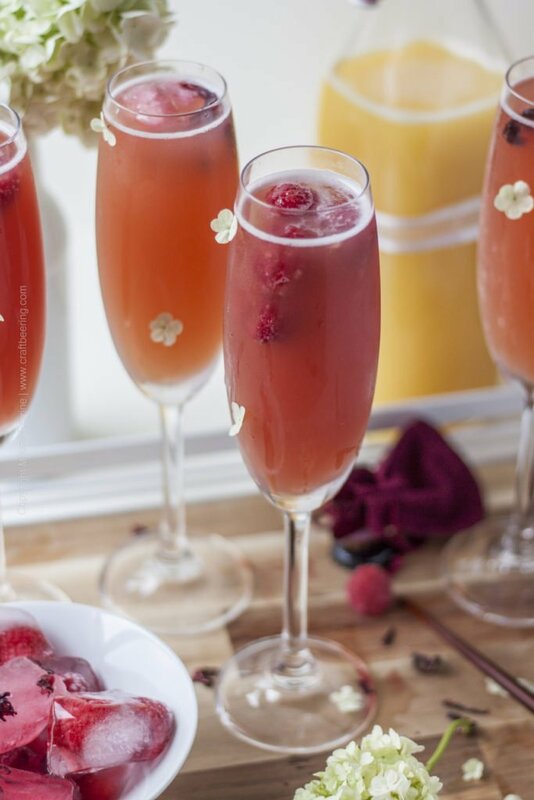 In addition to adding brightness and zing it can boost other aromas present in a cocktail. Astringency and acidity – when a very dry yeast or an abundance of tannic material has played a role in the fermentation of a beer the resulting dryness and astringency are especially well suited for pairing with other sweet and sour tastes. 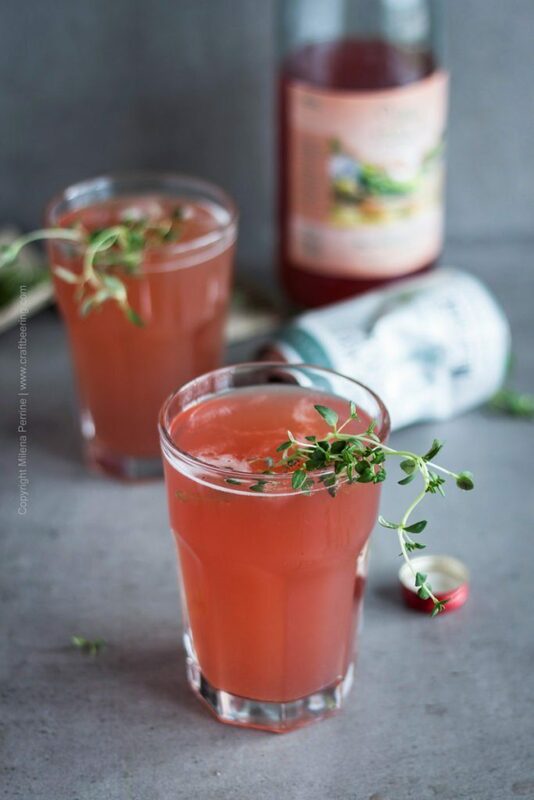 Tart beer styles shine in cocktails where pronounced acidity is needed or typical – for example these Strawberry Sorbet Forzen Margarita and this Gose Beergarita. Sweetness/Bitterness – if you are not a fan of overly sweet cocktails you will probably welcome the bitterness of hoppier beer styles in your cocktails. 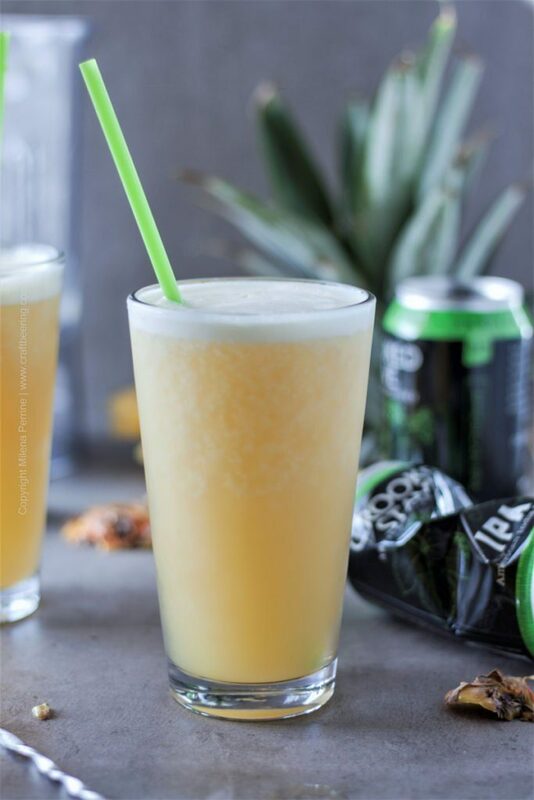 A great example is using IPAs in Pina Colada or fruity frozen drinks such as Pineapple Juicy IPA Slushie or IPA Mango Slushie. The coffee like bitterness and aroma of roasted barley used in stouts makes them perfect as cocktail mixers, especially in combination with whiskey. 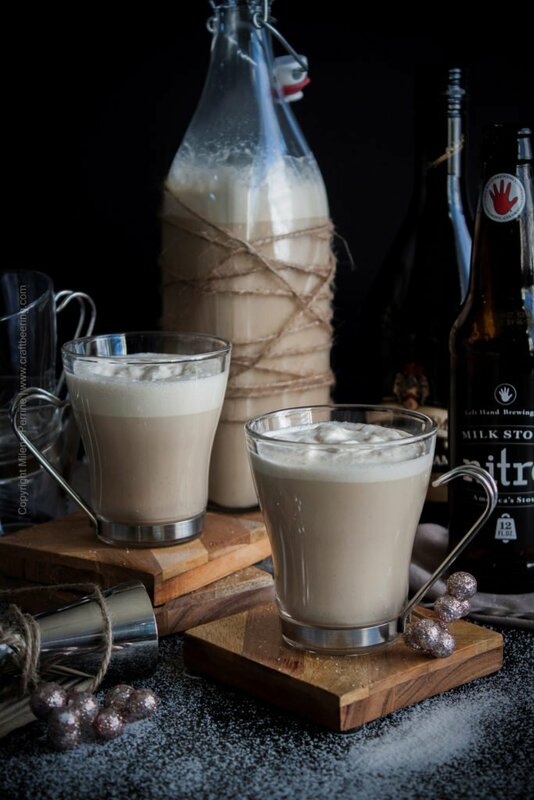 On the flip side certain styles known for their sweetness integrate beautifully in cocktails meant to be shamelessly sweet – for example a nitro milk stout in beer nog. 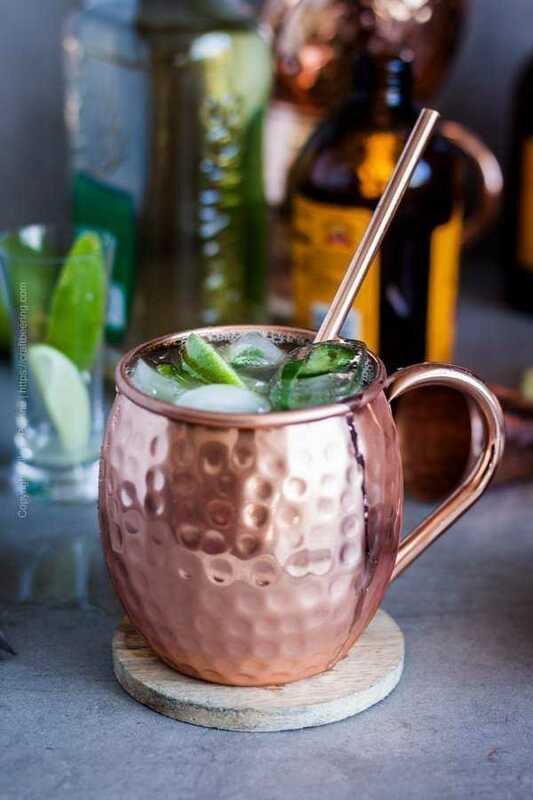 Total ABV – this goes without saying, but be mindful of the total alcohol by volume of the cocktail you are mixing. An easy to drink, smooth yet strong beer in combination with a shot or two of liquor will result in a deceptively delicious combination – case in point this Blueberry Sour Ale Vodka Beertini. Or when making Mulled Ale the combination of brandy and a winter warmer could easily get your head spinning. Glassware – enjoying your beer cocktail in a suitable glass has great impact on the drinking experience. 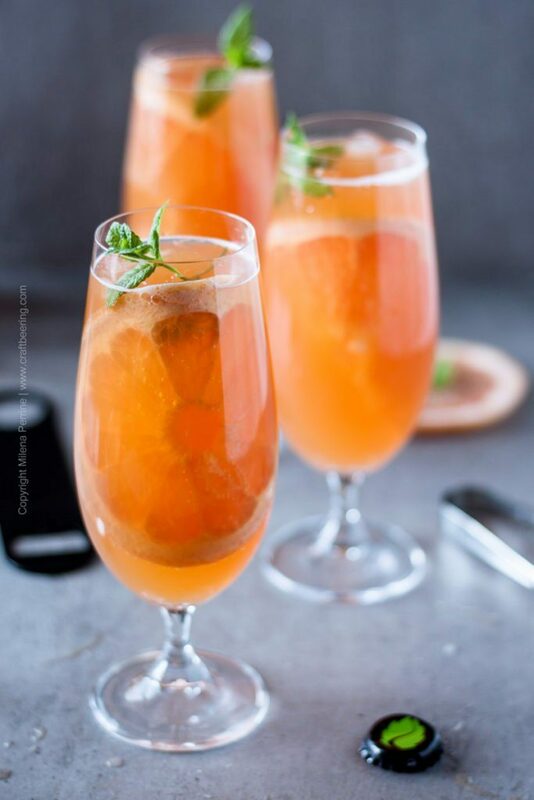 A champagne flute is perfect for a Beermosa or Black Velvet, a tall and skinny glass is prefect for a Beer Mojito, a rock glass is suitable for cocktails with bourbon/scotch and so on. Garnishes – through their taste or aroma garnishes complete the blend of flavors in a beer cocktail. A hops salt rim is unmatched for a beergarita mixed with a citrusy IPA, a slice of fresh grapefruit ties together IPA and soda in a Grapefruit Shandy, thyme is prefect in a glass of Farmhouse Shandy or in the case of Winter Beer Sangria – a cinnamon stick used as a cocktail stirrer adds just the right touch. 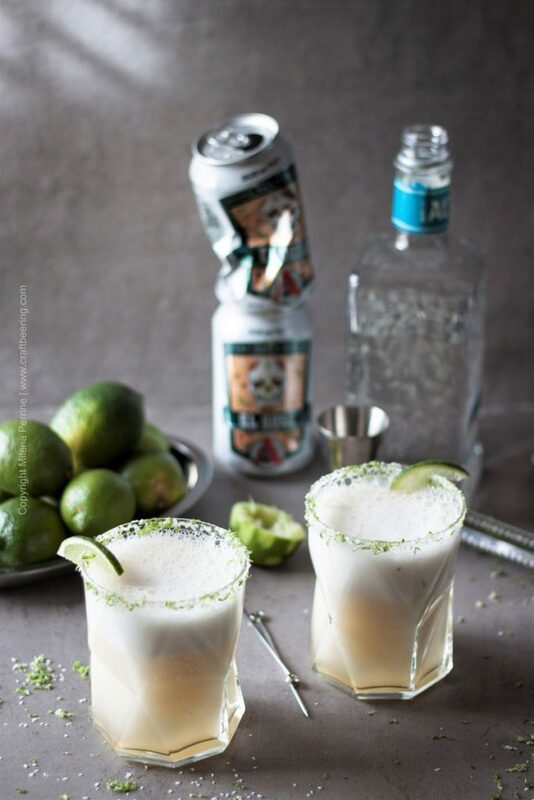 The easiest way to get into mixing your cocktails with beer is to start substituting certain ingredients in a well established mixed drink recipe. For example a Long Island Iced Tea could absolutely welcome a saison, a pale ale or an IPA. Blending beer styles is also a fun way to create – try equal parts of raspberry flavored ale and porter or equal parts of kriek and chocolate stout. 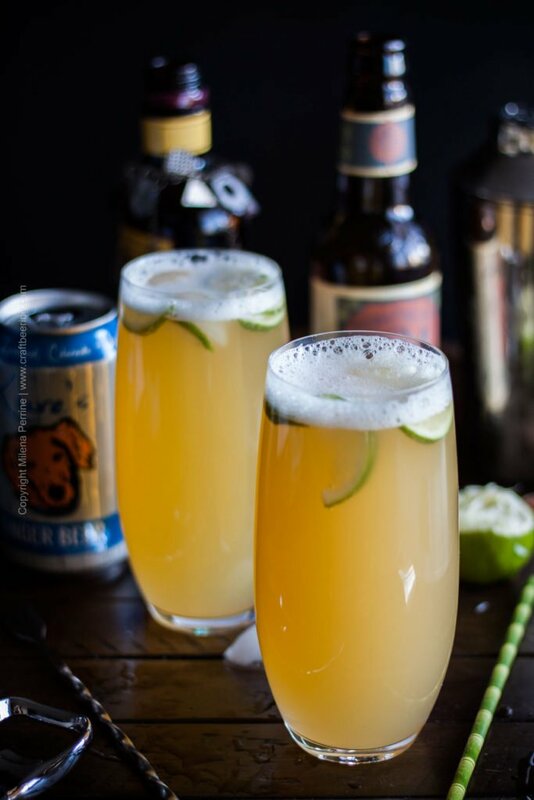 Tips and ideas on mixing beer cocktails. 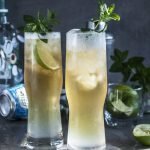 Page with links to numerous recipes for beer cocktails. 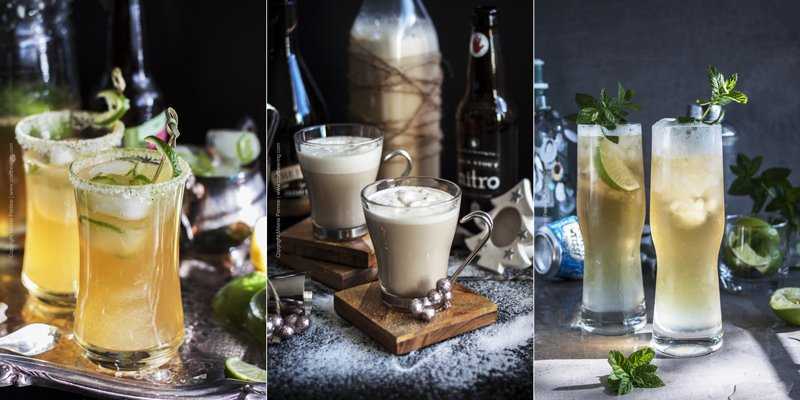 Classic, innovative and twists on mainstream mixed drinks using beer as ingredient. 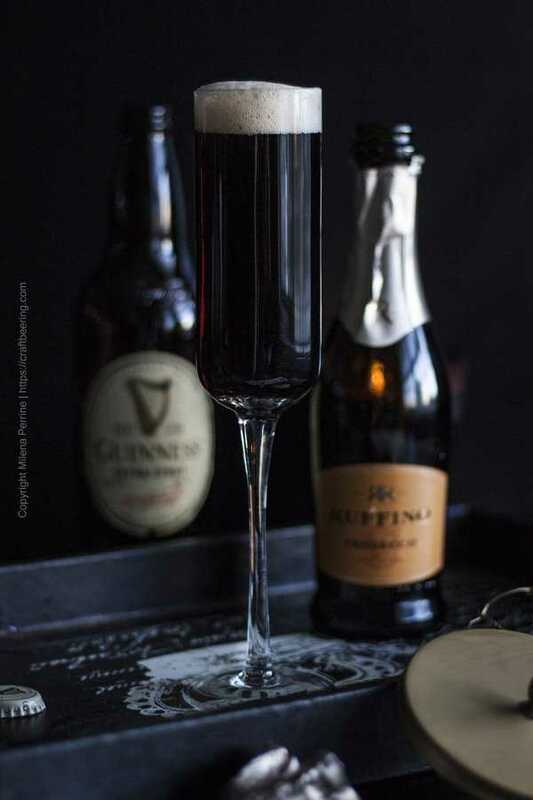 Stout beer cocktails - fancy a Dragonglass or Black Velvet? Brunch beer cocktails - from Beermosa to Mexican beer cocktails. 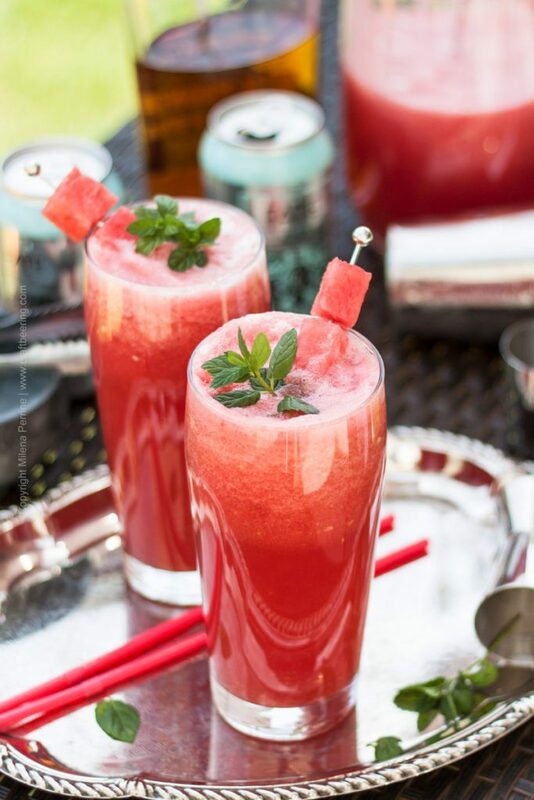 Refreshing summer beer cocktails such as Juicy IPA Pineapple Slushie or Beer Mojito. 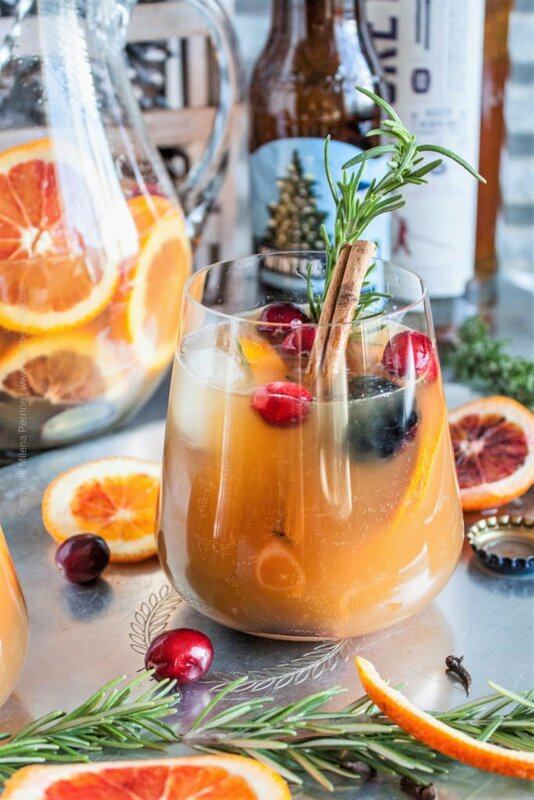 Winter beer cocktails - from Mulled Ale to Beer Nog and Winter Beer Sangria.